Big Peat Christmas Edition 2014 (55.7%): Lately fall started to feel way colder around here... My winter hats and jackets are already out of the closet and our blankets are placed next to the couch in front of the TV. I am actually pretty excited for the whole thing. Cannot wait for seeing some snow on the streets, spending more time indoors and getting ready for the holidays... Ok, I know we still have a little time till holidays but I am already starting to get into the mood. 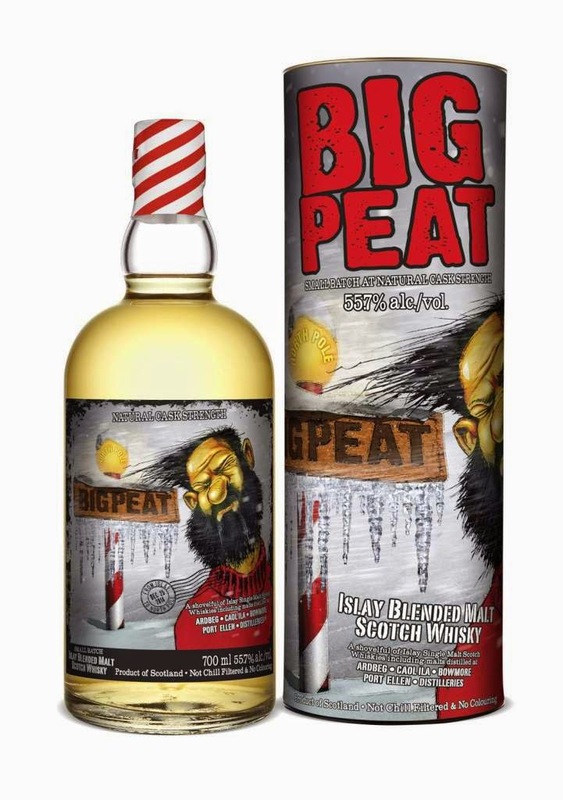 Well, apparently I am not the only one: Big Peat's Christmas Edition is out..! Douglas Laing & Co. Ltd. released their seasonal release a few weeks ago. Like always it is a blended malt using whiskies sourced from Islay distilleries only and bottled at cask strength. Color: Pale, lemon peel, dry straw. Nose: Very fruity: First hit the citrusy aromas: Unsweetened fresh squeezed lemonade, yellow grapefruit and kumquat. Then I get ripe apples and cold pear compote. Sea spray, wet beach sand and cinnamon Altoids. All of these aromas remind me a good home made hot toddy on a cold winter evening. Unlit cigars, fireplace ash and uncured Genoa salami. Diesel fuel and engine oil soaked cotton wipes. Water brings up bitter greens, unstruck matches and green asparagus. Palate: Beef stew with prunes, cinnamon sticks and crispy bacon bits. Meaty, smoky and spicy. Powdered chipotle pepper, dried seaweed and spicy banana pepper pickles. Even a few drops of water round the spicy edges and make it incredibly drinkable. More bacon, barbecue and raw leather notes but less citrus. Finish: Gets quite sweet at the finish. Ginger, ground cinnamon and white pepper. Long and very enjoyable. Overall: I am sold... Definitely getting a bottle before Holidays. It is a very well thought Christmas edition with tons of spices, cured meat and BBQ. I could nose the empty glass for hours and I will. A truly holiday feast... Only if I had a fireplace to enjoy this dram in front of. Thanks to Brad Jarvis a.k.a. The Whisky Professor for the official sample.